USS Strong (DD 467), apparently in Maine waters, 1942. Loss of Strong, 5 July 1943. USS Strong, DD 467, was “a ship of uncommon capabilities . . . with elements of real greatness.” Admired for the professionalism of her largely-New England-born crew by those who knew her in the South Pacific, she was also so highly regarded by her own shipmates that, the day after her sinking in 1943, they circulated a petition requesting the Navy to commission another USS Strong with the same officers and men. Visit Project USS Strong DD 467. Named for a Civil War-era naval officer, Strong was laid down with Chevalier at Maine’s Bath Iron Works in 1941 and—after Chevalier plus predecessors Nicholas and O’Bannon—was the fourth ship of the 2,100-ton Fletcher-class launched there in 1942. Commissioned seventh of 175 ships in the class, she derived her character in part from the many New England officers recruited by her skipper, Cmdr. (later RAdm.) Joseph H. “Gus” Wellings. Like many other 2,100-tonners commissioned in the summer of 1942, Strong served in the Atlantic, supporting the invasion of North Africa, before sailing for the South Pacific. She arrived in the Solomon Islands in February 1943, just as the Guadalcanal campaign was concluding. Assigned with her three older Bath-built sisters to Destroyer Division 41 in Destroyer Squadron 21, she sank on 7 April a submarine previously damaged during O’Bannon’s “Maine potato episode” and engaged in patrol and shore bombardment during the following New Georgia campaign. Strong and O’Bannon practice firing off Espiritu Santo. In the early hours of 5 July, Strong was operating with RAdm. W. L. “Pug” Ainsworth’s Task Force 18—light cruisers Honolulu, Helena and St. Louis plus DesDiv 41—on a bombardment mission to Kula Gulf in the New Georgia Island Group. With inadequate warning to evade, she was hit by a “Long Lance” torpedo launched at least 15 minutes (and three radical course changes) earlier by one of three undetected enemy destroyers. 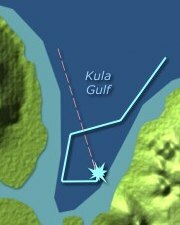 As shore batteries on nearby New Georgia Island quickly found Strong’s range and O’Bannon returned fire, Chevalier deliberately rammed her and, in seven minutes before she sank, succeeded in taking off most of her crew. Strong was, after De Haven, the second Fletcher-class destroyer lost, having earned two battle stars on her Asiatic-Pacific campaign ribbon. Two hundred forty-nine officers and men survived from a total complement of 295. Although they were not reassigned together as they had hoped, their ship and captain inspired such pride that, later in the war on board other ships and even later in life, they continued to reflect on Strong’s particular spirit and on what her record might have been had she survived. In the late 1980s, her radar and sonar officer, then-Lt.(jg) Alton B. (“Al”) Grimes, prepared two volumes, USS Strong (DD 467) World War II Operations and Stories of USS Strong (DD 467), “ . . . for the personal information of survivors of the ship.” Here, with the kind permission of his wife, Frances and in collaboration with torpedo officer Milt Hackett, we revisit life on board Strong through selections from these two documents plus photos, logs and official reports, introductions to her namesake and design, and links and references to newly-available sources.